We congratulate all our staff members & students on featuring in Forbes India's list of 'Great Indian Schools,2018-19' (October edition). Let's keep the good work going. Link: http://www.forbesindia.com/med…/…/forbesindia_ver1_30oct.pdf(Page: 43). 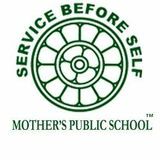 ABOUT US Mother’s Public School was established in 1991 as Prakrit, a pre-school with strength of about 17 students and 4 teachers. Over the years, it has grown to a Senior Secondary School with a strength of about 2100 students. The ideology behind starting the school was to cater to the needs of working mothers and it was launched as the first day-boarding school in the city. From the beginning, the school has focused on providing career-oriented education along with moral values and invaluable life skills. Over the last 25 years, the institution has become one of the leading educational institutions not only of the state of Odisha but also ofthe country. The alumni have gone on to pursue careers at various educational hubs of the world—from Masters in Law and Forensic Science in London to Engineering in Australia. 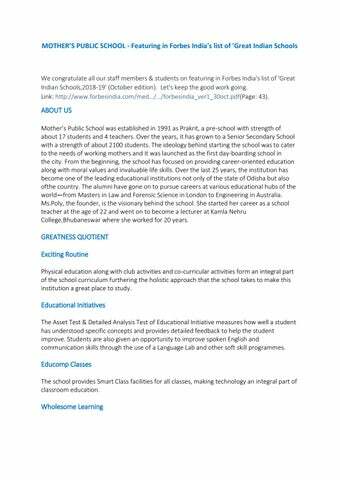 Ms.Poly, the founder, is the visionary behind the school. She started her career as a school teacher at the age of 22 and went on to become a lecturer at Kamla Nehru College,Bhubaneswar where she worked for 20 years. GREATNESS QUOTIENT Exciting Routine Physical education along with club activities and co-curricular activities form an integral part of the school curriculum furthering the holistic approach that the school takes to make this institution a great place to study. Educational Initiatives The Asset Test & Detailed Analysis Test of Educational Initiative measures how well a student has understood specific concepts and provides detailed feedback to help the student improve. Students are also given an opportunity to improve spoken English and communication skills through the use of a Language Lab and other soft skill programmes. Educomp Classes The school provides Smart Class facilities for all classes, making technology an integral part of classroom education. While academic rigor remains the focal point of the school, it also strives to provide moral values and invaluable life skills to develop tomorrow's decision-makers, critical thinkers and creative minds to face the challenges of the mid 21st century. Keeping up with the changing times, the school constantly updates learning and teaching methodologies for students and teachers We are one of the List of Top CBSE Schools in Odisha providing career oriented education enriched with moral values and invaluable life skills. Know more call 0674-2531550.